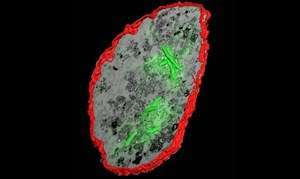 Researchers at the Francis Crick Institute have discovered that the bacterium responsible for tuberculosis (TB) can hide and live on inside the very immune cells that are sent to hunt and kill it. Daniel Greenwood, working in Maximiliano Gutierrez's lab at the Crick, explains his team's findings: "Macrophages are one of our immune system's main defences. These cells actively hunt down microbes, eating them and then killing them. But Mycobacterium tuberculosis - the bacterium that causes TB - subverts this killing process. "Like Jonah after being swallowed by the whale, M. tuberculosis can survive and even thrive inside macrophages before bursting back out into the body. But unlike Jonah, these ungrateful houseguests kill their host macrophage in the process. Thomas Lerner, a lead author of this work, explained: "People had assumed that this macrophage death is simply a by-product of the bacteria rupturing the cell on the way out, but instead our research finds that bacteria can live for days inside the dead cell, feasting on the remnants of their former host. In discovering this, we have found a previously unknown niche for bacterial replication in the body - with important consequences for understanding how TB persists and causes disease." To carry out their research, the team performed very high resolution microscopy of samples of live M. tuberculosis in human blood provided for research by donors at the NHS blood and transplant service. Their technique, called confocal fluorescence microscopy, allowed them to observe the whole infection cycle from the moment the bacteria were eaten by a macrophage to the moment they burst out of the dead cell and infected their neighbours. It showed in real time how the bacteria continued to replicate for days in the dead shell of their former host macrophage before eventually escaping. The scientists also used special chemical inhibitors to slow the death of the macrophages. This slowed the growth of the TB bacteria, showing how the death of the host cells promotes bacterial replication. Dr Gutierrez commented on the findings: "Last year, TB killed more people than any other infectious disease. Many other bacterial infections cause illness rapidly but can be cured by antibiotics within a few weeks. But for patients with TB, symptoms may not show for years after infection - if at all, and treatment takes a minimum of six months. Understanding better how these bacteria infect us and where they live in the body is key to our efforts to improve outcomes for people affected by this disease. "The bacteria that cause TB can infect many tissues in our bodies, from our lungs to our bones to our immune system. Macrophages are one of the first cell types to encounter the infection, and are therefore very important in determining the future of the outcome of the infection. This research demonstrates how M. tuberculosis kills its host cell and then lives on in the dead macrophage, providing a niche in which the bacteria can persist and replicate." The paper, Mycobacterium tuberculosis replicates within necrotic human macrophages, is published in the Journal of Cell Biology. The bacteria responsible for tuberculosis (TB) can live on, thriving and replicating, inside human immune cells called macrophages that are sent to hunt them down. The findings are important because this previously unknown niche for bacterial replication is a key step forward in understanding how TB can persist and cause disease, sometimes for many years after infection.